On this web site I have divided the history of the Island of Key Largo into four separate pages: North Key Largo, Key Largo (Click here), Rock Harbor (Click here) and Tavernier (Click here). None of these are incorporated; therefore, are simply non-specific communities which continue to evolve. As I write the community of Rock Harbor is fading. The community of Newport has faded other than for the name of a HUD housing project. Planter which once was all of southern Key Largo is now mostly a memory being replaced by Tavernier, the name of the railroad depot and second post office. Once concrete water cisterns dotted the shoreline, but development is taking them out. Time marches on. 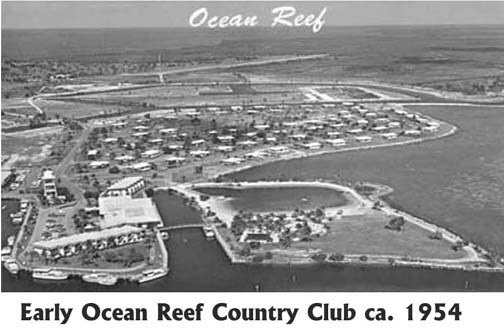 The north end of Key Largo, consisting of Ocean Reef and The Angler's Club, is generally thought of as a relatively new community. However, Capt. John Whalton had a garden along the Atlantic coast on north Key Largo, while manning the lightships Caesar [1826-30] and Florida [1830-37]. This was before the construction of the Carysfort Lighthouse in 1852. Capt. Whalton owned a house in Key West, but on occasion would bring his family to Key Largo. He had a garden and a building of some sort on the north Key Largo Atlantic shore, but it appears that he and his family stayed aboard-ship. The location of the lightship is thought to be in the area of Turtle Harbor. When Captain Whalton was coming ashore in June 1837, Indians killed him. His surviving family was taken to Indian Key and returned to Key West. Various news releases provide this information as it received considerable attention during the Second Seminole War (1835-1842). One surviving nautical chart denoting the incident is annotated Walton's Cove [sic] by HMSS Thunder Commander Barnett a few miles north of a line to the present day Carysfort Lighthouse. Basin Hills is also north of a line to Carysfort Lighhouse but not quite as much northward as Walton's Cove [sic]. My copy of the chart is not dated, but the HMS Survey ship Thunder was in operation from 1833 to 1853. The purpose for the chart was noting the Lightship Florida which he annotated Lat 25' degrees, 12 minutes and Long 80 degrees, 16 minutes, 20 seconds W.
Additional evidence of early habitation on Key Largo is from the wrecking court records of the ship Quebec dated 26 June 1848. Thomas Bennett of the wrecking sloop Empire testified, ". . . he sent off by George Richards, carpenter of the sloop, 17 small (not readable) rocking chairs and two paintings (all that he had) on shore to be stored in a house on Key Largo which is unoccupied. . ."
Passersby in ships made mention of a settlement on Key Largo in the mid-1800s, however no specifics. There are a few references to a late 1800s settlement at High Mangrove Point, which is a point of land on the ocean side just south of present-day Ocean Reef. There are no specific facts concerning this settlement, as there are about Basin Hills, which was a little farther south. Basin Hills existed in the same period as did Newport, Planter and Matecumbe. Its religious needs were served by the same itinerant Methodist ministers who served these communities on a weekly basis. There are two sources of material referring to a community named Red Bird City. The first source is a Miami Herald newspaper article of a Pinder family fishing, farming and collecting red birds on Key Largo. The article is of a Ridley Curtis Pinder whose father had four sisters married to other Pinders on Key Largo. CLICK HERE to read this article. The second source of the existence of Red Bird City is written account of Benjamin Russell by his great granddaughter, Marian L. Thompson, in collaboration with her mother, Elizabeth Page, and grandmother, Marian Russell. Research shows a Benjamin A. Russell did homestead on northern Key Largo in 1883 and the family is found in the 1885 census. Benjamin is 47 years old and his wife Ester is 39 and have five children: William W. (17), Nellie B. (11), Ella M. (8), Alice G. (6) and Marian L. (1). This account is very descriptive of family life in the early Keys and I suggest that it is a must-read. Please CLICK HERE. There is postal data of a settlement named Aiken that may have existed on North Key Largo around 1895. I wish to hear from any reader who could collaborate this early settlement. Throughout the Keys, there were scattered settlements even before the principal population movement that occurred when Florida became a U.S. Territory in 1821. Throughout the 1800s there was plenty of Florida land seemingly un-owned. With the official surveying of the Keys in 1872, land could then be confidently identified, purchased and resold. For example, Indian Key was bought and resold many times in the early 1800s, but was never legally owned by any of the buyers and sellers until 1910. One of these first North Key Largo land buyers was Samuel S. Lowe who purchased and homesteaded about 900 acres of land in the area of the old missile site on CR-905. The 1880 census reveals a Samuel Lowe, white, male, age 40, occupation “farmer” lived on Key Largo, Florida. He lived there with his wife, Euphemia, age 36, a son Benjamin, age 15, occupation “farm laborer” and two other younger children. I conclude that owning 900 acres qualify Samuel Lowe as a serious farmer. Most historians conclude that pineapples were the crop of choice in the late 1800s for Upper Keys farmers. It is estimated that 85% of the pineapples for the U.S. came from the Upper Keys. If pineapples was the crop of Mr. Lowe, he undoubtedly used the slash and burn method to perpetuate his crops. Pineapples primarily grew in the leaf mold generated by millenniums of native forests. Based of shipping information available and the soil condition, new land had had to be slashed and burned every three to four years; therefore, one can assume considerable land was cleared. The 1890 U.S. census for Florida was accidentally burned; therefore, it cannot be determined whether Samuel Lowe was still here in 1890. He is not listed in the 1900 census. A later North Key Largo land buyer was Thomas Lowe Sr. from the Bahamas, who purchased about $400 worth of land near High Mangrove Hammock. Thomas Lowe is found in the 1910 census. We have never found a recorded deed for his land; however, it is said to have bordered 36.5 acres recorded as Lot 5 of Section 32 of TS59S, R41E, which were purchased in 1886 by James Roberts. The story is that Lowe gave Pumpkin Key its name because he could grow pumpkins there, since there were no rodents to eat his crops. Tom Lowe and his son, Matt, made their living by catching fish and turtles, harvesting sponges and farming extensively pumpkins, melons and raising bees. It was not long before others moved in and settled. Flagler brought the railroad to Miami in 1896 and this brought new settlers and speculators to the Miami area. Soon Tom and Matt Lowe, and James Roberts were surrounded by privately owned land. C. E. Chillingsworth, an attorney, purchased the 40 acres that are the site of the today's Angler's Club. The land was resold in 1912 to a Mr. W. A. Scott from Fargo, North Dakota. Mr. Scott was serious about his fishing and constructed a first class two-story coral rock house. Life was much the same on North Key Largo as on the rest of the Upper Keys, except that they could boat more easily to Cutler, Coconut Grove and Miami. Goods could be purchased, sold or traded without involving a major voyage. Fresh water was caught and stored in cisterns and replenished from these communities during water shortages, using 50-gallon wooden whiskey barrels. Services from the mainland were also provided by passing sailboats traveling up and down Hawk Channel. A homemade boat named Dispatch would row out to meet the passing ships. In 1817 an American Merchantman named Despatch (sic) sank on Carysfort Reef while en route to Charleston. The use of the name Dispatch is prevalent in the area. There were no schools, stores, post offices, or doctors on North Key Largo at that time. The railroad changed people's lives in the Keys, as well as everywhere else in east Florida. Miami grew fast and by 1908 routine rail service was completed as far as Marathon. Monroe County funded a meager road on Key Largo in 1917 with a $100,000 bond issue and by 1927 had built the Card Sound Road with a wooden swing bridge to allow boat traffic to pass. By the following year, State Road 4A was officially completed and one could drive to Key West by auto by using the road and two ferries. The original road bumped across a series of wooden bridges from the east side of Card Sound and to the south about where the old missile site is located. Later, large amounts of explosives were required to build roads, canals and landfills in South Florida. Regular ships routinely ran aground, sunk, or otherwise blocked the narrow channel into the Port of Miami. To prevent a dynamite laden ship from blocking the Miami harbor, a pier was built out into the Atlantic just below present-day Ocean Reef for unloading this type of cargo. Explosives were also exported from this pier until an agreement was made with the DuPont Corporation to use its licensed dock near Port St. Lucie. The Key Largo pier became known as "Dynamite Docks" and later became the site of drug and alien-smuggling operations. Today, it is administered by the Florida Department of Environmental Protection. The old pier has been torn out and the natural water circulation restored. By the time of World War I, most of the land was deeded, but there was no significant building. Early North Key Largo property owners were Lowes, Roberts, Chillingsworths, Scotts, Porters, Grahams, Speers, Palmers, Hannahs, Pierces and others. Still, much of the land had been deeded to the Jacksonville, Tampa, Key West Railway Company and the Blue Springs, Orange City and Atlantic Railroad Company by the Swamplands Act of 1850. This land was given to the two companies to entice them to build railroads in north Florida. In the area of the Speers' property came a group of North Dakota land buyers. Research is difficult but perhaps not the first, a fisherman, Jack Graham, appears to entice other North Dakota buyers to group anound Township 59, Range 40, sections 12 and 13. The first obvious manifestation was when a W.A. Scott of Fargo, North Dakota build a very nice two-story coral rock house.